Connections between Jesus' so-called "triumphal entry" and a representative being kicked off the floor for wearing a hoodie might seem difficult to draw at first. But I can't help but ponder them. Today is the first day of Holy Week and perhaps it's the most ironic. It commemorates the day when Jesus rode on a donkey into Jerusalem while crowds of people celebrated his arrival. They dared to hope that this Jesus might be the one who would free them from their oppression and restore the world to right. But who were these crowds? Were they composed of the rich and powerful? No. The implication is that these people were the everyday rabble, the working and the poor. Mark's gospel tells us that the palm branches with which they paved the road before Jesus were gathered by the people "from the fields" (Mark 11:8 CEB). Which sort of people spend their time "in the fields"? The working poor. Their cries, "hosanna!" meaning "save us!," we're appropriate for people who were quite in tune with their own need for salvation, not so much for people with prestige and a sense (however false and subtle) of their own superiority. Not everyone seemed too happy that Jesus had arrived. Luke's gospel tells us that "Pharisees from the crowd said to Jesus, 'Teacher, scold your disciples! Tell them to stop!'" (Luke 19:39 CEB) Perhaps out of their sense of propriety, perhaps out of a notion that such a procession as the one that was unfolding was politically offensive and challenging to even their own authority. Maybe they were concerned that there would be a riot or "class warfare." Palm Sunday was a very political event in its context. Jesus' response these Pharisees was quite challenging, he answered, "I tell you, if they were silent, the stones would shout." (Luke 19:40 CEB) Jesus was, in essence, standing for their cause, affirming the validity of their cries for salvation even on behalf of the rocks, the creation. Jesus did not come to join the ranks of the powerful. He came in solidarity with the poor and the oppressed. He knew that such solidarity would lead him into opposition to the powerful and eventually to the cross. There's no coincidence that immediately after Jesus' interaction with the Pharisees, Jesus laments over Jerusalem. I can imagine the Pharisees remarks ringing in his ears as he weeps over the city. "Why don't they get it!? Don't they see... their salvation depends on the likes of these. The way of peace is about solidarity with these people, and they want them to shut up?!" So their king, the king of the poor and needy, enters the city on a donkey as a symbol of humility and gentleness and, ironically, of resistance to the intoxication of power and coercion. And he goes straight to work, clearing the temple and prophetically protesting the systemic corruption of Israel. Such civil disobedience, coupled with challenges to Roman authority and personal claims to the dignity of sinners and Samaritans, will lead him to the cross for his final and culminating work of incarnation, even of the healing of the world. The invitation of Palm Sunday is an invitation to solidarity with the poor and the oppressed, an invitation to "the things that lead to peace." Such an act as standing for a victim of injustice over against the authority of a State which refuses to concede its authority is very much in the spirit of Palm Sunday and Holy Week. To say, in essence, "if we are silent, even the rocks will cry out... that's how serious this is" in the face of an empire which demands silence and denial for the preservation of its own power is often an act of discipleship. Jesus said, "All who want to come after me must say no to themselves, take up their cross daily, and follow me." (Luke 9:23 CEB) Getting reprimanded and escorted away every once in a while should come as no surprise. God of all Power and authority, you enter our hearts and our communities in peace, celebrated by the ones who are aware of their need. But we don't recognize you so we fear you. We defend ourselves against you, we defend our power against you. We hang you on the cross because we do not understand you and we are suspicious of your presence. You look like our enemies and we were taught to hate our enemies. But you invite us to love you and even to love our enemies. You tell us that we are loved by you and that you know the things that lead to peace. Open our eyes, Jesus, for we want to see you. Let peace no longer be hidden from our eyes. Make us vulnerable to your salvation so that we might cry with the crowds, "Hosanna!" 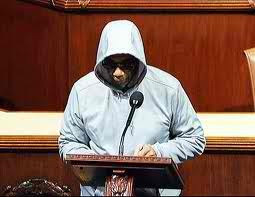 We pray in the name of the God who was killed with Trayvon Martin and is risen indeed. Amen. His name is Rush... Not brown. And solidarity with victims is what I was going for. Didn't sat Rush was a true victim himself. He knew what he was doing. Thanks for pointing out the name snafu. I would have looked like a real idiot. I just don't want Senator Rush's actions to be equated with solidarity with the poor especially since most of the facts on the ground are inconsistent and we aren't entirely sure what happened that night. The sensationalism of the case seems to have put the cart before the horse. Oh I don't know about that. We know for a fact that a boy is dead.